NEW EDITION for 2018!! 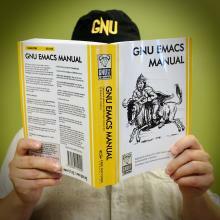 GNU Emacs is much more than a text editor; over the years it has expanded into an entire work flow environment. Programmers are impressed by its integrated debugging and project management features. 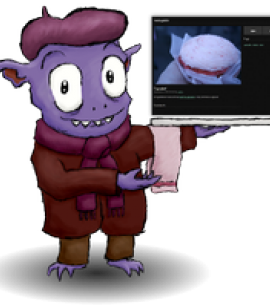 Emacs is also a multi-lingual text editor, can handle all your email and Usenet news needs, display web pages, and even has a diary and a calendar for your appointments. When you tire of all the work you can accomplish with it, Emacs contains games to play. 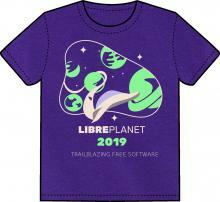 2019's LibrePlanet shirt comes in purple, high-quality cotton. The design imagines this year’s theme, “Trailblazing Free Software,” as a space journey to unexplored frontiers, featuring a cute little spaceship zooming out of a wormhole filled with eerie green planetoids. We have unisex and fitted sizes. The shirts are manufactured by Bella Canvas, which is WRAP-certified, meaning they comply with ethical, health, and safety standards in manufacturing. Plenty has already been said about Emacs, the text editor that edits text and does pretty much everything else besides. Whether you (or a friend) are already an experienced user or a beginner taking your first steps towards proficiency in this powerful program, there's a lot you'll find useful in the All Things Emacs bundle. Ten two-inch-square vinyl stickers bearing the 1987 GNU Emacs icon, depicting an overflowing kitchen sink, a witty metaphor for the text editor that truly does everything and then some. 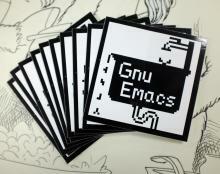 These stickers are also available as part of the All Things Emacs bundle. Ten vinyl stickers of the B(ourne) A(gain) SH(ell) logo, black-on-white. These are about five inches long and shaped like the bulb end of a leek. An excellent fit on your water bottle or bicycle tube. 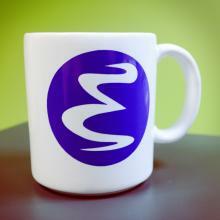 This white ceramic mug is festooned with the Emacs logo, and like Emacs it's versatile: It will hold eleven fluid ounces of coffee, tea, cocoa, yerba mate, a toddy of any kind, mulled cider, boullion, sake, Postum, buttered rum, bandrek, anijsmelk, posset, pretty much whatever you pour in it, so long as it remains upright. Pens and pencils, too. An excellent gift for the Emacs-proficient beverage enjoyer. 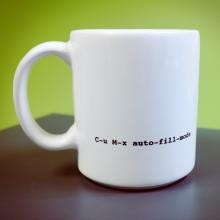 Inscription on reverse mirthfully implies that Emacs will refill your mug for you; please note that Emacs' beverage replenishment functionality is still undergoing preliminary testing. FST-01 (Flying Stone Tiny ZERO-ONE) is a tiny USB 32-bit computer based on a free (as in freedom) hardware design. NeuG is an implementation of a true random number generator (TRNG) for STM32F103 MCU. In this product, a standalone USB version of NeuG is installed, together with a USB Mass Storage Class device implementation named Fraucheky. It uses the thread library Chopstx. NeuG, Fraucheky, and Chopstx are licensed under the GNU GPLv3.